Over 150 members of Sunrise — including 14 Swatties — descended on the Capitol on Tues, Nov. 13 to demand that House Democrats create a “Green New Deal.” The Capitol Police eventually arrested six Swarthmore students, along with about 50 other protesters, for refusing to leave the office of Minority Leader Nancy Pelosi (D-CA); the footage of them being escorted out of the building racked up thousands of views on Facebook. Their protest made national news when freshman progressive representative Alexandria Ocasio-Cortez (D-NY) arrived at Sunrise’s sit-in to deliver a speech. On Tuesday, protesters streamed into Pelosi’s office, delivering handwritten letters about their personal connections to climate change and in favor of their proposed “Green New Deal.” Another group of Sunrise members then moved into Pelosi’s office and sat on the floor, refusing to leave. Sunrise’s Facebook Live Stream shows protesters listening intently as members delivered passionate speeches about the group’s goals. At one point, Ocasio-Cortez worked her way through a group of cameras to speak in front of the sit-in. Nearly all the protesters who were sitting in on Pelosi’s office were arrested by the Capitol Police and were taken in for booking. They were released later that day, and the arrests did not go onto their records. According to Sunrise member Anya Slepyan ’21, the group had prepared ahead of time for the arrest and had sought legal counsel. Cameras captured protesters exiting the building, guided by the Capitol Police, their shirts emblazoned with the phrase “12 Years” in reference to the UN Intergovernmental Panel on Climate Change report warning that the climate could reach 1.5 degrees Celsius of warming by 2030. Slepyan was among the protesters arrested in Pelosi’s office. “I was excited about it. Honestly, getting arrested for civil disobedience is on my bucket list,” she said. Sunrise, whose chapter at Swarthmore was previously known as Mountain Justice, is perhaps best known on campus for orchestrating a years-long campaign for fossil-fuel divestment, which as of yet has been unsuccessful at Swarthmore, though several movements inspired by Mountain Justice have made headway at other institutions. Last year, the Swarthmore chapter affiliated itself with the national climate advocacy group Sunrise and began to focus their actions more nationally, holding voter registration and information drives leading up to the 2018 midterms. 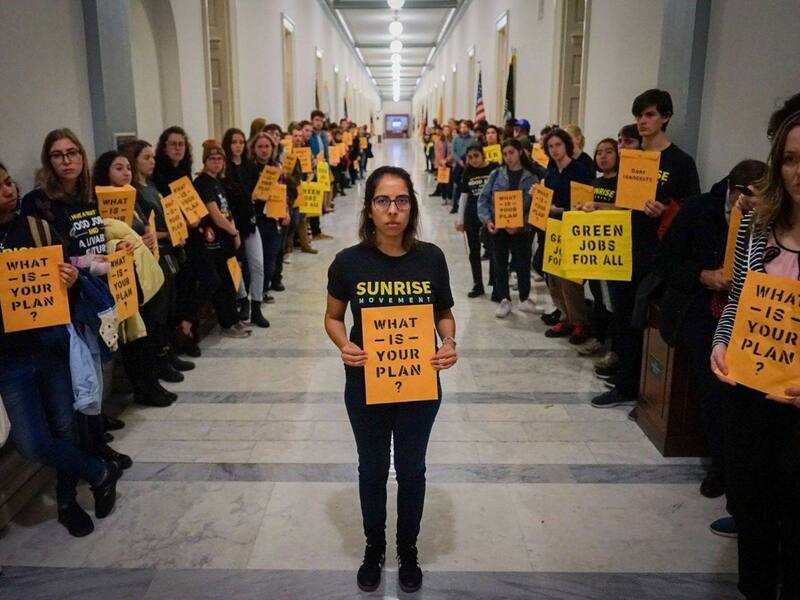 This protest is part of Sunrise’s larger campaign to push newly elected and re-elected Democrats to enact much more expansive climate legislation. Sunrise wants House Democrats to work on more ambitious climate legislation that could be enacted if Democrats regain control of the Senate or the presidency in the future. The Sunrise steering team, which includes Aru Shiney-Ajay ’20 and Swarthmore alumni Stephen O’Hanlon ’17 and Sara Blazevic ’14, collaborated with Ocasio-Cortez’s team to create a draft resolution that the representative-elect will introduce to House leadership. The draft resolution, which Ocasio-Cortez released on her website soon after the protest, would establish a “Select Committee for a Green New Deal.” Pelosi had previously announced that she would revive the House Select Committee on Energy Independence and Global Warming, which had been in place from 2007 to 2011 while Democrats held the House; however, she had not indicated that climate change legislation would be a top priority for House Democrats post-election. The draft resolution grants the select committee authority to “develop a detailed, national, industrial, economic mobilization plan for the transition of the United States economy to become carbon neutral and to significantly draw down and capture greenhouse gases from the atmosphere and oceans and to promote economic and environmental justice and equality.” Among other things, Sunrise calls upon the committee to draft legislation that would expand green jobs, move the U.S. to 100% renewable energy, and lessen the impact of socioeconomic inequality brought about by climate change. According to Sunrise, the arrests were a matter of showing politicians that they were willing to put themselves at risk for climate legislation. National media seized on the protest — and, in particular, Ocasio-Cortez’s appearance — as a symbol of intra-left conflict. “A Left Flank Protest on Day 1 Signals A Democratic House Divided” read a New York Times headline. However, Sunrise members rejected this narrative. 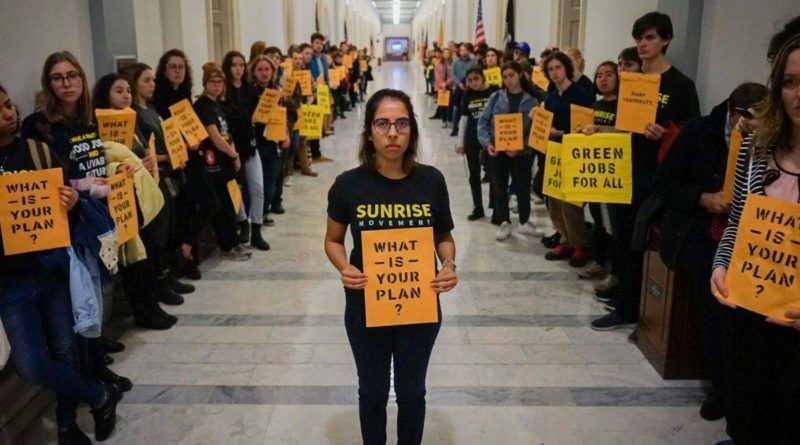 In the coming weeks, Sunrise members will continue to lobby newly-elected legislators, attempting to get them to sign on to their “Green New Deal” resolution. Regardless of immediate outcome, though, they view the protest on Tuesday as a victory. “We got so many people to take off time to do this and get arrested. It was really exciting for everyone who has been in Sunrise before to see the passion: how it’s grown to 200 people sitting around in Nancy Pelosi’s office, and how it’s grown at Swarthmore,” Walker said. Maybe the kids should learn something before protesting. There is no way some irrational pipe dream about wind and solar is going to solve the problem. Nuclear might. We need actual solutions that are workable and won’t create even more worldwide social injustice in the name of “climate justice,” whatever the hell that even means. Swarthmore is really starting to seem like a place where the next generation of effete extremists are created, not a place that teaches people to understand the world and who can think critically and solve problems.